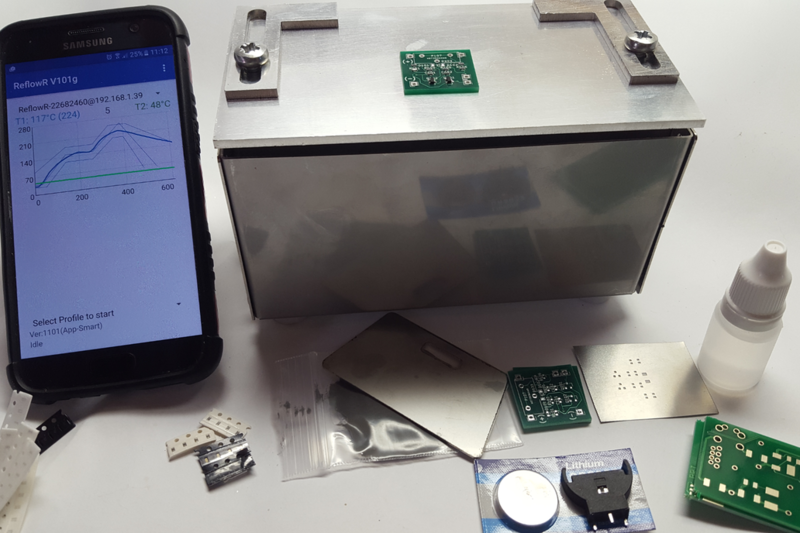 A compact tool for working with, and learning about real surface mount electronic components. 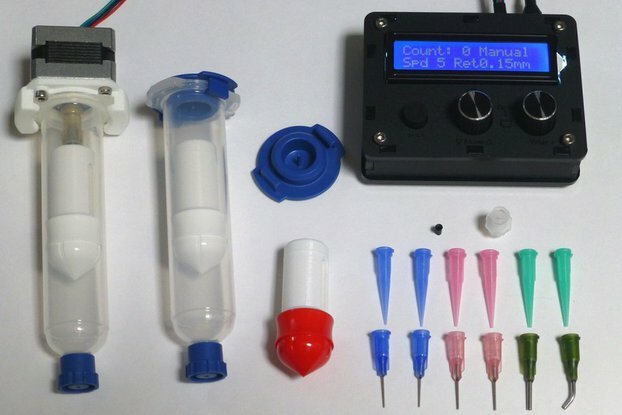 Add an external second thermocouple input connector and a K type thermocouple to your Smart or Large ReflowR. (Must be shipped with a Smart or Large ReflowR). The inspiration kits gives you everything you need to practice and build 4 fun mini projects with modern surface mount components. I have 5 Large ReflowR's and 3 Smart ReflowR's ready to ship on Wednesday/Thursday via DHL express to be with you by Wednesday the 5th! Now shipping via DHL express with 3 to 5 day delivery. 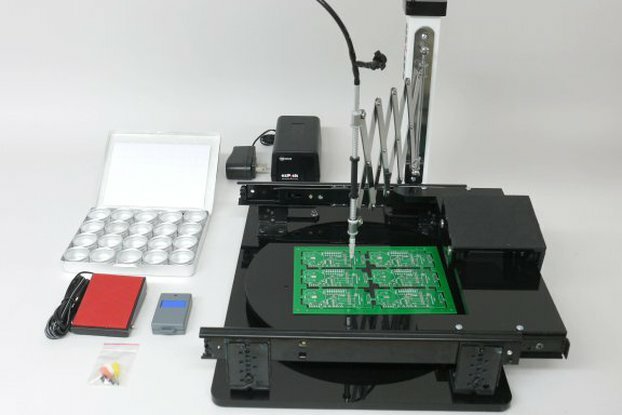 Modern electronics make extensive use of surface mount components, but there is no convenient, affordable, small desktop reflow tool available. ReflowR is a great small tool to make working with surface mount components just so much easier. What are the advances of Version 2? After having sold over 200 of the original reflowRs, I have listened to my supporters, and have added an LCD Display for the Large model. I have also improved the heater reliability and improved the packaging and shipping. I have hand built hundreds of SMT prototypes and short production runs myself, I have tried and experimented with just about every technique and tool. 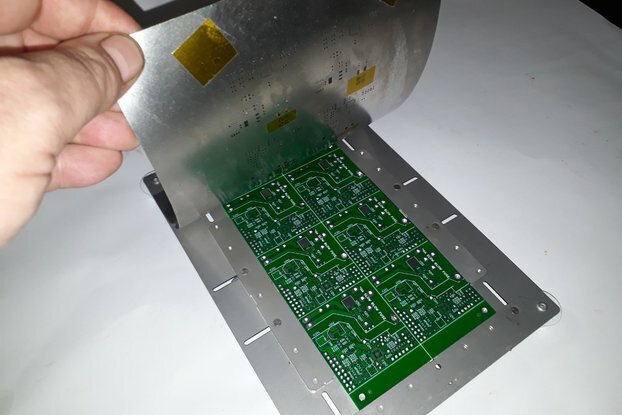 Recently I designed and started to use my own reflowing tool, I was so pleased by how much easier it makes working with and repairing SMT boards I just had to share it. 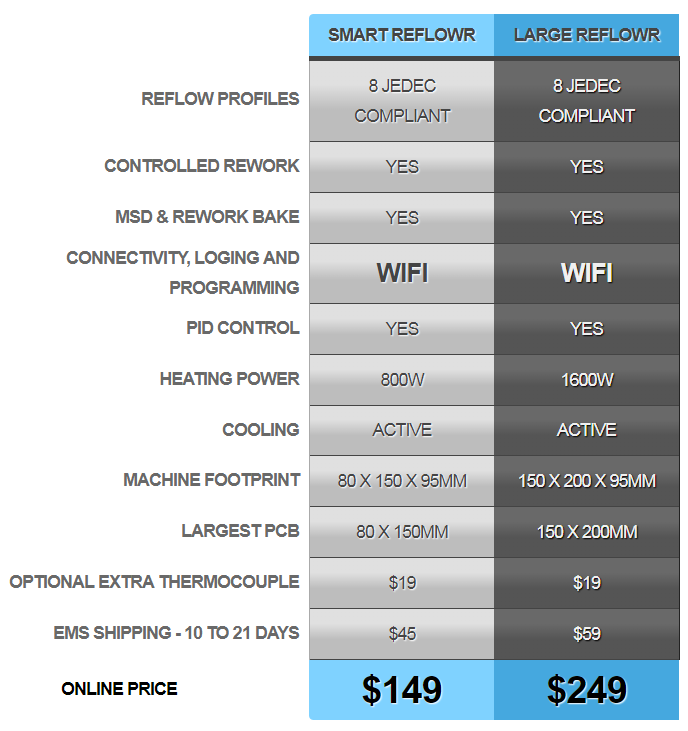 Get a reflowR and see for yourself. Stress reducing - Less worry that human error will burn your board and ruin your effort and parts, less worry that thermal shock will make your board fail as soon as it leaves your hands and ruin your reputation. Superior even temperature - Unlike heavy cast pans, electric aluminium skillets or toasted ovens that are designed to cook food, The reflowR is designed specifically to heat PCB's, it uses a special large flat heater element and thick aluminum plate right between the heater and the top plate to spread the heat evenly across the entire PCB without uneven cold spots like with this $400+ toaster oven and controller example. Proper PID temperature control - JEDEC reflow profiles compliant. Small heat capacity and thermal mass, with active cooling and microprocessor control, delivers fast, accurate temperature rise and fall. Improved quality - reflowR won't discolor your boards and your solder joints will be smooth and shiny. Consistency - each board is reflowed almost exactly the same, eliminating human error and variation due to hots spots in skillets and toaster ovens. Superior rework function - Reworking large parts like Quad Flat Packs (QFP) can be problematic when having to apply heat with a hot air pencil or trying to hold a board on a skillet while trying to prod the part with tweezers or a soldering iron, all the while rushing and panicking that you are overheating the part or damaging the board. With a ReflowR the board will be held in place and brought up to just the right temperature so that you can place and exactly re-align the parts without stress on the part or your nerves. Web app and open web service - In addition to the phone app, a PC app and a web app is under development so it can be controlled from any browser. It will also have a JSON based web service so you can write your own app and control the reflowR directly if you like. Auxiliary Thermocouple input - provides an optional external second thermocouple input to monitor temperature either at the top of the PCB or on large components such as connectors. Consider adding an Auxiliary Thermal Probe Upgrade which includes a K type thermocouple. 100V / 115V / 230V AC operation - Each ReflowR is shipped configured for your country, but there is an internal changeover if you need change it. After many complaints caused by poor service from the post office, I now ship only via DHL express, as a private company they give great service. No more lost parcels or waiting weeks without knowing if it will ever arrive! Delivery is reliable and the fast, normal delivery is expected in 3 to 5 days. Product is ok but actually getting it was the problem. I purchase the large Reflowr on 22 Jan and I received a shipping notification a few days later. Great! A week later I sent another message and I finally got a response, apparently it was never even shipped! I sent another message a few days later to confirm it has been shipped and if there was a new tracking number but never got a response from that! Anyway package has finally arrived after over a month so very poor shipping and communication. On arrival, the box was pretty beat up but no real damage to the unit. The instructions asked me to remove some small yellow plastic pieces before use, however they had all broken and fallen inside the unit, so I had to pull it apart to get them out. Finally I was ready to make up the board which went quite well so no real issues there! I couldnt get the device to connect to my own wifi although it said it was successful in the app, but it never got an IP address or appeared in my router. So I just had to connect directly to its own wifi. Still havnt worked that out. In short, product and document is good, the rest of the experience was below average. i found it to encourage 'a dab hand' approach, first uses being carefully done, to then a real rewarding sence of confidence in being able to slightly mess about with the thing (as solid rewards.) Deserves a better postal sytem, but who doesn't? remember to be nice to the posty....thats what makes the posty nice to you! EVERYONE THAT GETS ONE OF THESE THAT WORKS, IS A WINNER! I've been using this little beast for a few months now and frankly I'm impressed. I've reflowed dozens of boards and I'm not even tempted to use my reflow oven for single sided boards. Sure the android app is a little wonky, and the sheet metal enclosure isn't Apple perfect, but for 129 bucks plus shipping the ReflowR is an amazing deal. Stop dithering and just order one. I bought the larger ReflowR in June and it was apparently lost in shipping. Not deterred, I ordered a second one and am really pleased with the purchase. If you've used one of the small IR ovens you know the problems with hot/cold spots in the oven and the terrible smell most of them have. The ReflowR is exactly the right fix for this. I'm using it for light production work and am very pleased with it. Even at twice the price. Great item, you won't be disappointed with product! Lafras communicated about the product very well and promptly. The price is definitely right for what the product does. Finish quality is about as expected for something that is hand tooled and made in smaller runs. My reflowr was missing a couple rivets but it may have been from shipping vibrations (also Customs opened/inspected the package, so they may have taken the rivets out in an attempt to see what was inside the precarious metal box with wires!). My only suggestion to Lafras would be better packing for shipment - bigger box with foam for absorbing impacts - the box was only couple inches bigger than item in all directions which is risky for intercontinental shipments. It is nice Lafras includes some PCB boards and components so you can immediately play around with the Reflowr without using your own prototype boards as guinea pigs. This tool allowed me to move beyond through-hole components in my projects. It is very simple to use and clearly documented. Works well both standalone and with an android app. Nice addition was a mini-tutorial with sample PCB boards and components to try things out. Shipping time was as advertised, not too long. Packing was a bit tight, but the unit arrived in a good condition. Ordered on June 28, 2017. Shipped according Lafras Jul 03, 2017 via South African Post Office from Durban (tracking never worked for me). Notified on August 5, 2017 from Lafras: "I expect all European shipments including July to arrive 6 to 8 weeks from now". After delivery urging Lafras on September 19, 2017: "Your tracking info says on route. After 3 October it will be 90 days then I can escalate with the post office and get a more complete answer." After another delivery urging Lafras on October 15, 2017: "You are in the group of 7 European parcels that have not yet been delivered, they all had movement mid August, and 2 of them (France and Netherlands) scanned in the destination countries this last week. I am optimistic the rest will be scanned in the destination countries soon and delivered before month end." December 20th, 2017: "Your ReflowR has been sent by airmail, It is expected to take 2 to 4 weeks to reach you." BTW: I am not able to rate product (because I do not have it) but I am not allowed to post review without product rating, so just ignore my product ratings please. I have been waiting for feedback on the escalation of the issue with the post office but have had no luck. I now have to assume the parcel is lost. I will dispatch a replacement via airmail during this week. This is my first time at reflow having stuck to the traditional soldering iron and I have had great success. The unit is uncomplicated and performs as it should. I used the inbuilt profiles and successfully reflowed some xson (3mm x 5mm) chips and other just as small items. The owner responded to all my questions on reflow in general and just not about the reflowr which was greatly appreciated. As an aside I received the reflowr in half the shipping time that was quoted. Having used this for a couple of weeks I have really grown to appreciate it, the review by "Manuel" is pretty balanced and summarises the product well, except I would say I have grown to like the simple lines of the construction. Does it reflow boards - Yes it does and with the Android app it is easy to pick profiles or build a custom one. When my unit arrived it was actually configured for 110 Volts when I needed 240, I took a peek inside and could see it was probably just a case of reconfiguring the heater winding via the connector and no big deal (i.e. The unit was designed to ship as either 110 or 230/240 volts). I sent Lafras an email and he replied within few hours confirming this and with a diagram showing how to move the heater connector - Great service. Looking inside the construction seems very sound and to be frank both the operating temperature and the volts bite, so I am happy that someone else has made a working unit. The cool down is a bit slow but nothing to worry about. All in all I am very pleased with the unit. TLDR; Easy to use, not very nice, works well. + Without external thermocouple QFN with thermal pad parts as well as fine pitch connectors (<0.5mm) where reflowed successfully. + Easy to mount and dismount, also very compact form factor. + No burnt solder masks, my PCB still had the beautiful classic mat green solder mask we all love. + The seller responded very fast on my questions. 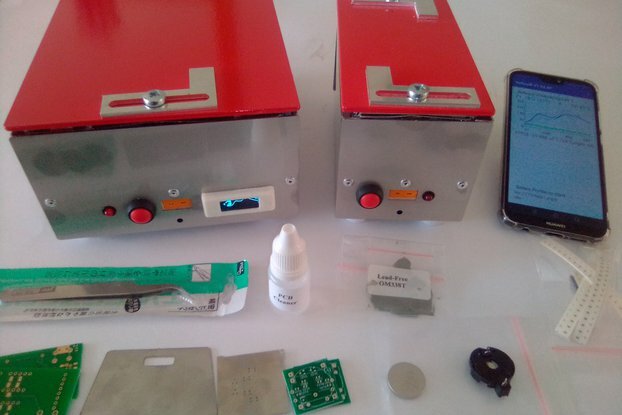 - Cools down slowly, it might require you to remove the PCB from the hot plate depending on the required reflow profile. - No desktop client/app/script. Only android right now. I was not able to find any protocol specifications to quickly write a PC client. - Sometimes ordering a stencil with your boards let's you reach the "free shipping" threshold, and therefore you get a stencil at quite the same price than without. - LED's require a more precise placement. They tend to not put themselves straight during reflow like other passives. Resistors can be placed miserably and still will put themselves right during reflow. - When putting solder paste with a stencil for very small parts, try to use one (not the old one you had laying around since the beginning of recorded history). - When reflowing multiple times (should be avoided) the PCB may starts to warp. But it didn't affect too much the process in my case. This might be an issue depending on your layout. Try to put all components at once. - Put a "Hot surface" sticker on the box, it really not a toy. I am satisfied with the results. The product not the nicest one, but it don't mind. It does the job quite well even without external thermocouple in my case. I would have appreciated a PC client or any open documentation about the protocol. I feel like this tool is a good value if you have small parts or high density prototypes and dont want to spend two more weeks waiting for a company to populate your board. I feel like the price is appropriate for this tool. and planning to do very low volume production for some of them. I couldn't find a suitable reflow oven/hot plate, they were simply too big. 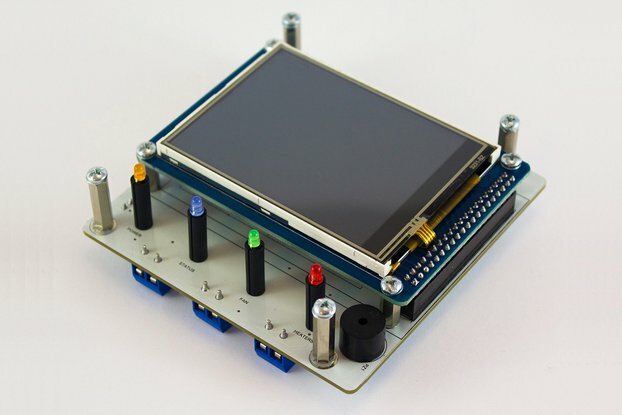 Then I saw this one on Tindie. There were no reviews, so I was hesitant a bit. But the idea was great, just what I was looking for. The indigogo campaign apparently did well. - It arrived in 7 days from South Africa to San Franciso/USA for $44 express shipping. the reflow at first. Few days later, it was upgraded and asked me to upgrade the firmware. network at 2.2Ghz, but not 801ac 5Ghz. - The youtube video and doc was easy to follow. I was able to build the sample circuit and it worked. But the doc is only a paper copy. I couldn't locate it on the web page. So, if you use IOS and keep your paper copy around. - The paper doc reads 10uF but the provided capacitors measured 3.7uF. I've used 10uF from my stock. - The cooling is little slower than the profile, as expressed by the maker, but it should be fine. - The webpage can use a facelift, there are easy to use tools/services like wordpress, weebly, wix etc. Ordered May 24th 2017. Shipped June 2nd. But then it took 1 month to get from Hillcrest to "DURMAIL INTERNATIONAL", which I assume is still in the vicinity of Durban. I have been waiting for 53 days since shipping now. Everyone should discuss with this seller about the shipping options. I have shipped many items from Asia with 45+ day shipping services and they never take this long. 1 month prior to leaving the country of origin is a joke. I am very distressed that normal shipping is taking so long, Since your order, I have updated the main page with information on shipping and tracking, EMS shipping is quite quick, I regret not recommending it from the start. I which there was something I could do to make them deliver faster. So far we are eagerly awaiting its arrival and I cannot get to 100 Characters with nothing to talk about.